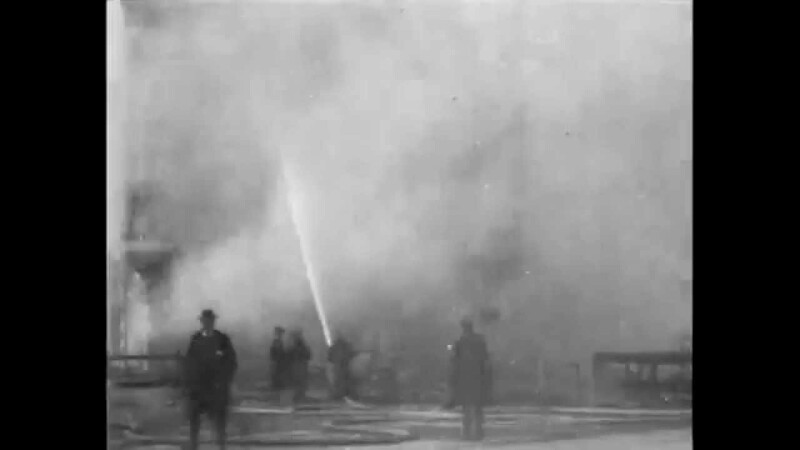 Actuality footage of firefighters in action is spliced together in this topical Edison short from the early years of cinema. The film was taken on location at a fire in an urban area. The first shot is a pan through the streets which stops at the firefighters spraying their hose into a gigantic cloud of smoke. Some spectators stand and watch, but as the movie proceeds, we see a lot of pedestrians pass by without apparent interest. A few stare at the camera. The second shot is taken from much closer to the group of firefighters and their hose, and seems to be later, as we see ruined walls and piles of rubble, but far less smoke. The camera pans away from them to show a half-collapsed wall and another hose further down the street. It then pans back to the main group of firefighter, training their hose into the midst of the smoke and passes them to find a man with a shovel digging through rubble. A final edit shows us a crowd watching a wall collapse, apparently from quite nearby. Once the dust clears a bit, a few of the men strike at the rubble with picks. As I’ve noted before, firefighters were popular figures at the time, and we’ve seen them in a number of films, but this is the earliest example so far of them actually fighting a fire. It’s pretty much newsreel footage, nothing seems to have been faked, and the camera shows us what it can of the situation. We’ve moved into an era when Edison camera operators are comfortable with pans, and do them without much planning or preparation, to get as broad a view of the scene as possible. Durland’s Riding Academy was in Manhattan, where the Edison Studios were now headquartered, and the camera was mobile enough to get to the scene in time to get footage of the fire in progress. No doubt this fire was still in the news when this movie was being shown, and people were excited to be able to “see” the news as well as read about it.